OBJECTIVE: 4 Kidz with Lambuel! Kidz Crafts Kidz Artwork Gallery Draw Lambuel! Dress Up Lambuel! Hello! My name is Lambuel and I hope that we can be friends. 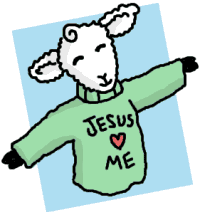 I would like to share with you my love for Jesus. Did you know that Jesus loves each and every one of us? It's true! In the Bible, He says: "For God so loved the world, that he gave his only begotten Son, that whosoever believeth in him should not perish, but have everlasting life"... Isn't that COOL?! And for all He's done for us, all Jesus wants is for us to love Him back! He wants us to love Him soooo much that any other love would be like hate: "If any man come to me, and hate not his father, and mother, and wife, and children, and brethren, and sisters, yea, and his own life also, he cannot be my disciple." I love Jesus more than ANYTHING... how 'bout YOU? My OBJECTIVE is JUST 4 KIDZ! The "Z" is for "ZEALOUSNESS," 'cause Jesus wants us to be hot for Him, not lukewarm. I read in the Bible that He said: "As many as I love, I rebuke and chasten: be zealous therefore, and repent"... Let's do that! Have fun, and remember: JESUS & I YOU! Oh no! Lambuel is late for Church! 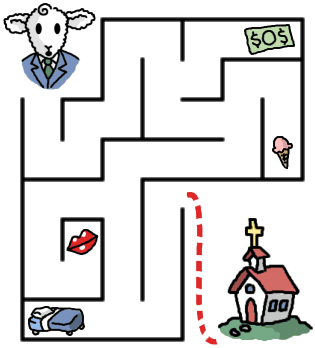 Can you help Lambuel get to the Church on time while avoiding temptations along the way? thinks Lambuel is cute and wants to marry him one day! ...but then why are they always so sad? 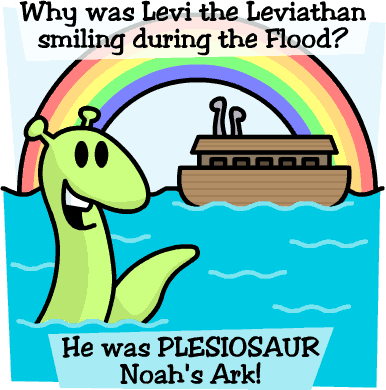 Wrong, little buddy - Dinosaurs still walk on the land and swim in the seas! And the Earth is only 10,000 years old! Incredible but TRUE! Hopsiah the Kanga-Jew knows history because his family lived it! Hopsiah lives in the Middle East, where his ancestors and those of all the other animals and humans alive today exited Noah's Ark 4,000 years ago. But unlike the other Kangaroos who hopped to Australia, Hopsiah's family stayed behind to witness the coming of the Messiah! Make Lambuel wear all sorts of silly clothes! that your (and your neighbor's) kids will love!